Is blithe and bonny and good and gay." 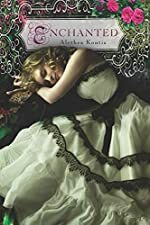 Review: Enchanted by Althea Kontis is the perfect mix of all the fairytales that you are familiar with. Enchanted explores different personalities within a family. Seven and Jack Woodcutter are parents of ten children, and Sunday is the seventh. One day in the woods while writing in her journal, she meets a frog who calls himself Grumble. When Sunday introduces Grumble to her brother, Trix, she feels that he won't doubt her friendship towards a frog. But when Grumble asks her to kiss him, she starts thinking that maybe does she loves Grumble . . .
Sunday doesn't think that anybody in her family is normal. And she is right. Whatever Sunday seems to write, it comes true. For example, Sunday wrote that she didn't have to go to the market with her family. Then she became ill with the flu and had to stay in bed for a week! Ever since then, Sunday sticks to writing about her family. But when she meets Grumble, she thinks of the possibility of writing about how Grumble turns back to the man he was. But anything could go terribly wrong. I really love Enchanted because I feel like I know some kind of back story. This is mainly because of the liberal use of fairytales like The Princess and the Frog. We know what happens in the story, but the twist in Enchanted makes you want to just tell someone that 'I was right! This DID happen!' I admire how Althea Kontis weaves stories together and how they somehow all fit together. The plot is told with so much detail, it's like you are inside Sunday's head. I rate Enchanted 4 out of 5 stars because it sometimes lost my concentration when I felt there were too many details. But, I recommend this book if you are a fantasy lover, realistic fiction lover, or a lover of both. Enjoy reading Enchanted! Review written by Sahaj (7th grade student). We would like to thank Houghton Mifflin Harcourt for providing a copy of Enchanted for this review. Have you read Enchanted? How would you rate it? Thank you, Sahaj! You are my hero. Amazing job Sahaj! I can't not love your review, and Enchanted is deffinetly a book I am going to read.